PETALING JAYA, MALAYSIA – Former PKR Youth chief Ezam Mohd Nor, who has since joined Umno, is willing to take on PKR de facto leader Datuk Seri Anwar Ibrahim in a by-election. He said he was not afraid of facing his former boss if selected by the Barisan Nasional leadership to contest in the election, preferably in the Bandar Tun Razak parliamentary constituency. Ezam, who rejoined Umno on May 28, said he was an ordinary of Umno member and it was up to the leadership to make a decision on the candidate to take on Anwar. Please click to read the whole article. This entry was posted in Elections, Politics and tagged Anwar Ibrahim, By-Election, Ezam Mohd Nor. Bookmark the permalink. I would love to see Ezam lose his deposit…lose face…and finally last but not least, lose his to soul to corruption. Go for it Ezam! BERANI KE KAU ADZAM BERLAWAN DALAM KANDANG ANUAR. LAWAN TETAP LAWAN. KALAU KAU MENANG TENTU LAYAK JADI KETUA PEMUDA UMNO. DAN TERUS MENTERILAH. DI PERMATANG PAUH LAH EDZAM… BUKAN DI KULIM ATAU BANDAR TUN RAZAK. LAIN KALI RISIK BAGI BETUL. 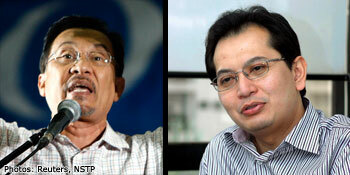 I would love to see Ezam contest against YAB Anwar Ibrahim. Let the Voice of the people be heard…Ezam, you will meet your fate for your deeds. The truth will prevail.